The most played sport in the world, and extremely lucrative for those few that have the talent to play professionally. Whether you want to improve your first touch, passing ability, or simply sick of kicking a ball up against a concrete wall – then finding what the best soccer rebounders are could be the be perfect piece of equipment for you. Simply buying a rebounder won’t make you a professional instantly – nor will owning one make you better. Using it, however, can aid serious improvement to your individual technical skills. In this guide, we look at all the industry leading soccer rebounder nets to ensure you find the right one that meets your budget. Everything on this list is considered to be of the highest quality. We then aim to answer any lingering questions you may have about rebounder nets. Whether you’re a coach, a parent, or an individual who wants to add this to their arsenal – this guide will remove any doubts you may have. What are the Best Soccer Rebounders? If you have social media, there’s a high chance you’ve seen this already. For us, it’s the best option for anyone looking for a good soccer rebounder. The SKLZ Quickster Soccer Trainer oozes class and quality. Builds up to a 6 x 4 foot size – which is a very typical size for portable goals. Better yet, there are two separate nets as part of the equipment for different training drills. One side (the bigger side) is designed to aid volley and first touch practice. This gives a relatively true flight path of the ball allowing the player to get used to trapping and controlling soccer balls coming at them. Alternatively, the other side is perfect to trap and control ground passes, or practice your ground passes against. Weighing in at 1.6lb – this is seriously portable too. The SKLZ Quickster rebounder net takes literally minutes to set up, and the same to take down. You can get started straight away on it. It also comes with a carry case and 4 ground stakes. The stakes aren’t necessary, but for full stability and efficiency, the net should be staked into the ground. Our top recommendation, supported by the recommendation by countless of Amazon reviewers. 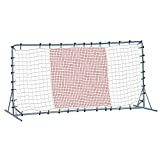 Another fantastic soccer rebounder net – and one of Amazon’s best sellers. This actually isn’t a dedicated soccer net. Alongside soccer, this net can also be used for Basketball, Lacrosse, Baseball etc. But don’t let its multi purpose deter you. 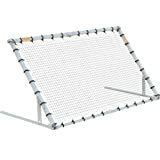 The Tekk Trainer Rebounder is made with an extremely durable and springy net that is perfect for kicking a ball against. The small grids of the net, along with it’s springiness allows for the ball to rebound at almost game like speed. Better yet, it can be adjusted to seven different angles to allow for different skill sets to be trained. Such is popularity of this rebounder net, the Tekk Trainer has consistently been used in soccer academies across the globe. Simply looking at the characteristics of the rebounder net, you can immediately tell that it’s a product well engineered. It’s made to last with it’s aircraft grade aluminium tubing, and heavy duty brackets. Note that because of the extremely high grade material, the rebounder net is on the heavier side. With one of the biggest surface areas of any soccer rebounder on the market, this is a highly durable and professional rebounder net that is well worth it’s high price tag. If you’re serious about training, this could very well be the product for you. Slightly different, but still pretty nifty. The Goalrilla Striker Soccer Goal Rebounder is a piece of equipment specifically designed to serve more than one purpose. As you can evidently see, the whole thing acts as a goal on one side standing at a size of about 6ft by 4ft. A great size to practice accurate placement of shots. On the other side, however, the net can be used as a rebounder to practice receiving the ball. With the net having a serious spring to it, shooting at the goal means that retrieving the ball is no longer a time consuming process. Durability is also kept in mind here. The entire goal and net is made to last, and will survive for years – with the poles powder coated to prevent rust. However, with the bulky size of it, it isn’t exactly the most portable soccer rebounder on this list. We think that in order to aid overall stability, it’s probably a good idea to stake the goal down. However, due to its design and structure, it’s not completely necessary. Another pricey option, but this will last for years. Multipurpose, and great to shoot at. Definitely belongs in this list of best soccer rebounders. Franklin, a brand that is commonly known as releasing quality gear and exceptionally low prices does not go amiss here. The Franklin Sports Tournament Quality Soccer Rebounder is not only one of the best value for money on this list, people have consistently praised its performance. A well made, durable soccer rebounder constructed from galvanized steel and an all-weather target net. Comes in at a huge 12-feet x 6-feet. Only legitimately rivalled by the following Trigon Sport. With a net of such size, it works great to act as a proper sized goal to shoot at. Further, it has a double-sided design that Franklin say allows for more than one player to use the net at the same time. Great for younger aged soccer teams, or as a backyard fixture. However, again – this isn’t a portable net. Yes it’s lightweight and not too much of a hassle to put up and take down, we can assure you that if you’re after portability, this isn’t for you. Great as a backyard rebounder, or to add to your inventory as a coach. A highly reputable brand, well worth its price. Sometimes simplicity is the best. You get what you see here, and to be honest, it’s probably exactly what some people need. A fantastic alternative to the Franklin option above. The Trigon Sports Soccer Rebounder is exactly what it looks like. It’s an absolutely huge rebounder that sits vertically for you to practice shooting against, passing against, and practicing your first touch. It comes in a 6 foot x 12 foot size, so don’t expect portability here. It’s a more ideal set up for people who want a more permanent rebounder fixture in their lives. A backyard, or local soccer team is probably the most ideal location for this net. Durability shouldn’t be an issue either. The net is made with heavy duty, weather resistant material – placed on a powder coated steel tubing to remove any rust concerns. Trigon say you don’t need to peg the rebounder down. Like always though, with heavy shooting, it will topple over. Always best to stabilise it to maximise your training without worrying about it’s overall stability. Highly rated by many who own it, another extremely large soccer rebounder available at such high quality. Size is the first factor to consider. As you’d expect, bigger rebounder nets are a larger target to aim at. The bigger the net though, the less you’re able to adjust it. In addition to this, it’s pretty obvious that there’s no point buying a 6 x 12ft rebounder if you don’t have the space to train with. You will also need to be able to store the rebounder when you’re not using it. With size, comes the thought of portability. The smaller the size, typically the more portable it is. As we’ve stated in the article, not all of the best soccer rebounders are portable. But sometimes, portability isn’t a concern. If you are seeking to find a good rebounder for individual use in your backyard – then portability shouldn’t be a factor to consider at all. Similarly, if the net is going to live at your local soccer club – then size shouldn’t matter. However, if you’re going to lug your rebounder to and from the park all the time – then take note of how the rebounders fold down. Keeping in mind how long each one takes to set up is also of primary consideration. Finally, price is something you need to think about. Obviously this comes down to judging what your budget is. There’s usually something for everyone’s budget. Note that every rebounder on this list has considered it’s price as a factor. However, it’s always best to check them out for yourself. This is, after all, your purchase and your money. Soccer rebounders aren’t brand spanking new to the market. In actual fact – the original rebounders were typically just a simple, plain old brick wall. The damage caused to the ball was unforgivable and irreparable. The rebounders on this list have become a revelation for individuals and teams who are serious about improvement. We’ve mentioned a few times now, but when used properly, these nets can improve your first touch, volleying, passing, and shooting technique. Use your weak foot to strengthen that too. All without destroying your soccer ball. Professionals do use rebounders, so don’t just think it’s a beginner or gimmick. They offer a fantastic way to keep engaged whilst training – and due to the different angles and designs that rebounders have, players are able to train more than just their wall passing skills that a brick wall can only offer. When it comes to soccer rebounders, there’s genuinely a whole heap on the market you can look at. However, if you want something that’s durable, performs well, and is priced decently – then the options on this list should guide you enough to aid your decisions. For us, we cannot go past the SKLZ Quickster Rebounder. It’s a superior product that is not only super portable, but performs spectacularly. Rebounders truely could be the catalyst to aid you on your way in becoming a better soccer player.